I used to hand-stitch photos together in Photoshop from whatever digital snapshot camera I was using, approved which was horribly time-consuming. This year, I discovered the iPhone app 360 Panorama – which lets you basically scan an entire 360-degree panorama within about a minute (or 90 seconds at night) and then automatically stitches the images together and uploads them. The results can be kind of kludgy at times – edges don’t mesh well if you spin imperfectly, or if your iPhone vignettes photos at night. 360 Panorama: Self-portrait inside JANUS – Waiting for the Department of Mutant Vehicles to inspect and clear us for nighttime driving. 360 Panorama: JANUS and other vehicles in line in the DMV inspection lanes. 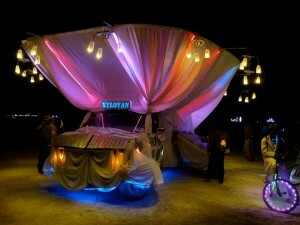 360 Panorama: JANUS and other mutant vehicles at the Temple of Transition. 360 Panorama: The Kidsville tour circles up between JANUS and the Temple. 360 Panorama: The Circle of Regional Effigies – wooden structures and sculptures built and then burned at once by 23 regional Burning Man communities from around the world. Our own Los Angeles was represented by SCARAB, a food truck that served snow cones and chips to burners before being burned on Thursday night. 360 Panorama: Before any major burn, mutant vehicles gather on the playa like fishing boats circling a fruitful patch of ocean. Here, JANUS and the submarine join others ringing the site of the Trojan Horse burn. Thronged by burners and mutant vehicles, the Trojan Horse – all 5,600 pounds of it – goes up in flames. 360 Panorama – The Man, about to burn. 360 Panorama – Tearing down JANUS and striking camp – a day-long affair. The work was long and hard (we went from about 10 a.m. to 8 p.m.) but the weather was gentle, and the dust not too bad. 360 Panorama – Exodus. Tens of thousands of vehicles stream towards the exit – basically eight lanes of cars, driving through the dust and the night towards a pinch-point one lane wide that lets them out onto the main road back through Gerlach. Timed right, you can be on the road in 20 minutes. Timed wrong – when most people are leaving – it can stretch to 3 or 4 hours. We stopped in Center Camp to get drinks right after the Temple Burn on Sunday night this year, and so escaped to the road in about 2 hours. This entry was posted on Friday, September 9th, 2011 at 9:30 amand is filed under . You can follow any responses to this entry through the RSS 2.0 feed. You can skip to the end and leave a response. Pinging is currently not allowed.